Luxurious chocolate and fresh, perfectly ripe strawberries come together in this decadent, classic chocolate covered fruit creation. 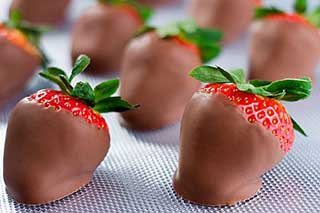 We deliver ½ dozen of the absolute sweetest, most appealing strawberries, dipped in a mouthwatering chocolate directly to your suite. The taste: pure perfection.